Abstract. Plant water-use efficiency (WUE), which is the ratio of the uptake of carbon dioxide through photosynthesis to the loss of water through transpiration, is a very useful metric of the functioning of the land biosphere. WUE is expected to increase with atmospheric CO2, but to decline with increasing atmospheric evaporative demand – which can arise from increases in near-surface temperature or decreases in relative humidity. We have used Δ13C measurements from tree rings, along with eddy covariance measurements from Fluxnet sites, to estimate the sensitivities of WUE to changes in CO2 and atmospheric humidity deficit. 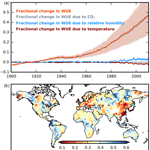 This enables us to reconstruct fractional changes in WUE, based on changes in atmospheric climate and CO2, for the entire period of the instrumental global climate record. We estimate that overall WUE increased from 1900 to 2010 by 48±22%, which is more than double that simulated by the latest Earth System Models. This long-term trend is largely driven by increases in CO2, but significant inter-annual variability and regional differences are evident due to variations in temperature and relative humidity. There are several highly populated regions, such as western Europe and East Asia, where the rate of increase of WUE has declined sharply in the last 2 decades. Our data-based analysis indicates increases in WUE that typically exceed those simulated by Earth System Models – implying that these models are either underestimating increases in photosynthesis or underestimating reductions in transpiration. How to cite: Dekker, S. C., Groenendijk, M., Booth, B. B. B., Huntingford, C., and Cox, P. M.: Spatial and temporal variations in plant water-use efficiency inferred from tree-ring, eddy covariance and atmospheric observations, Earth Syst. Dynam., 7, 525-533, https://doi.org/10.5194/esd-7-525-2016, 2016. 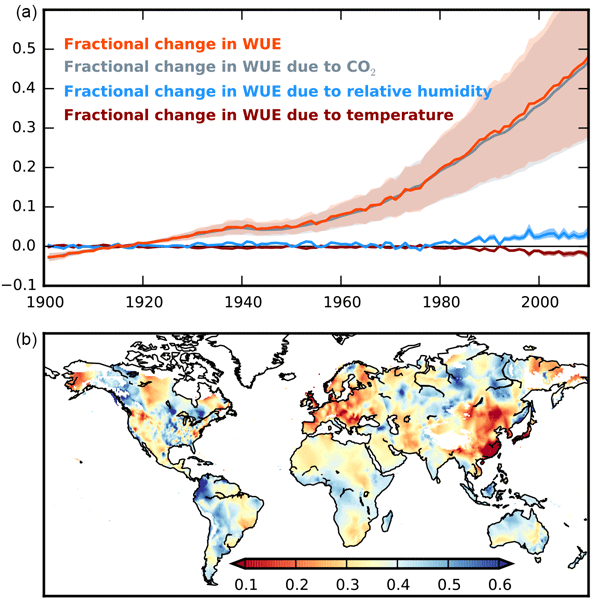 Our analysis allows us to infer maps of changing plant water-use efficiency (WUE) for 1901–2010, using atmospheric observations of temperature, humidity and CO2. Our estimated increase in global WUE is consistent with the tree-ring and eddy covariance data, but much larger than the historical WUE increases simulated by Earth System Models (ESMs). We therefore conclude that the effects of increasing CO2 on plant WUE are significantly underestimated in the latest climate projections.